⦿ Second or Distal Convoluted Tubule. The proximal portion of the renal tubule which is present in the form of many coils is called as Proximal Convoluted Tubule (PCT). Glucose, amino acids, Vitamin-c , Potassium, calcium, sodium chloride, 75% of water, etc, are the substances reabsorbed into peritubular network from Proximal Convoluted Tubule (PCT) . The distal portion of the renal tubule which is present in the form of many coils is called as Distal Convoluted Tubule (DCT). Urea, uric acid, creatinine, sodium, potassium, hydrogen ions are secreted into Distal Convoluted Tubule (DCT). The Distal Convoluted Tubule (DCT) opens into a collecting tube. The middle U-shaped portion of the renal tubule present between the Proximal and Distal Convoluted Tubules is called as Loop of Henle. The Loop of Henle lies in the Medulla of the kidney. The cells present in the Proximal Convoluted Tubule (PCT) have brush border which is capable of absorption. Distal Convoluted Tubule (DCT) is the highly coiled part found in the medulla of the kidney. Proximal Convoluted Tubule (PCT) receives primary urine from glomerulus. Distal Convoluted Tubule (DCT) receives urine from the glomerulus. PCT regulates excretion of urine by absorbing excess water from primary urine. In DCT, water and salts are secreted. A small amount of tubular secretion also takes place in the Proximal Convoluted Tubule (PCT). The secretion of wastes of ions takes place in the Distal Convoluted Tubule (DCT). The substances which are reabsorbed into peritubular network from PCT are glucose, amino acid's, vitamin-c, potassium, Calcium, sodium chloride, 75% of water, etc. The substances like urea, uric acid, creatinine, sodium, potassium, hydrogen ions are secreted into DCT. 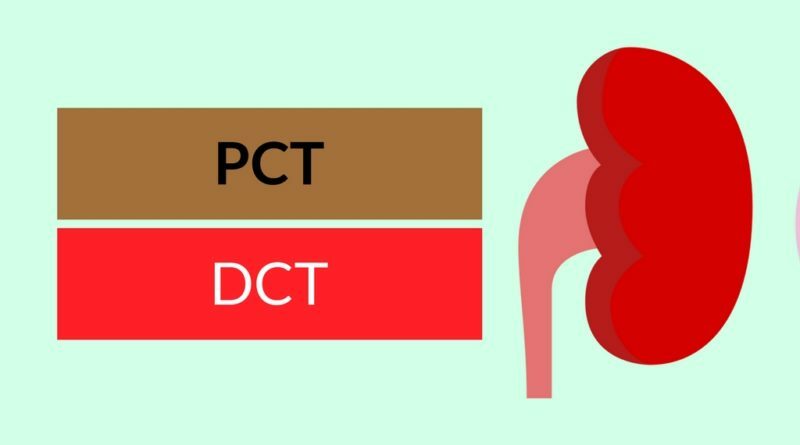 The PCT, DCT and the Loop of Henle are the main parts of the renal tubule which is the part of the nephron. Nephrons are located in the inner medullary zone of internal kidney. Each kidney is made up of approximately more than 1 million nephrons.